A New German Raw Materials Strategy: A Modern “Enclosure Of The Commons”? Lithium and cobalt for producing automobile batteries; titanium, chrome and palladium for desalination of sea water; ruthenium and selenium for photovoltaics, rare earths1 for cellphones and laptops – European industry relies on minerals, most of which must be imported, for developing and using numerous technologies of the future. Long-term security of supply of so-called “critical” raw materials was not considered an issue just a few years ago, but the topic has now been thrust to the top of the political agenda. For this reason, the German federal government passed a raw materials strategy in October 2010. The European Commission presented a new version of its 2008 Raw Materials Initiative in February 2011 as well. Both strategies are intended to help ensure a reliable supply of important minerals for European and German industry via trade and investment policy, especially using instruments of foreign trade policy. Like all natural resources, these raw materials are first of all common resources. For this reason, the classical question of the commons arises here, too: How do we handle them so that whatever must be shared can be used in a meaningful and fair way for all without harming others? How are we to understand the new German raw materials strategy against the background of this question? Only very recently has the debate around the availability of mineral resources come to a head. In the absence of growing interest in communication technologies and renewable energies, many of these raw materials would simply remain in the ground. In addition, their increased exploitation not only raises the question of distribution of these minerals, but also systematically results in additional conflicts around the use of other common resources. Finally, the exploitation of rare minerals interferes considerably with land use and soil structures, water regimes and forestry. As a rule, however, common use of these resources is in the interest of the local population. The increasing exploitation of mineral resources often makes it impossible to use them in a commons-based way. The negative impacts of mining raw materials in developing countries2 with weak institutions, combined with intensive use of common land and forests, an undocumented source of income or food for the poor, have been demonstrated in many cases using the terms “resource curse” and “paradox of plenty.” Some raw materials are even used for technologies whose meaning and purpose for the community can be questioned as such, for example, military technologies. Numerous companies are involved directly or indirectly in human rights violations, environmental destruction and conflicts via their exploration activities or their trade in raw materials. For instance, the German company H. C. Starck has been accused of indirect involvement in financing the civil war in the Democratic Republic of the Congo due to its trade in coltan. In its new raw materials strategy, the German federal government “emphasizes” human rights and “will increase its support” for ensuring that ecological and social standards are observed. Yet it does not engage in any systematic efforts to include those standards in their instruments for promoting foreign trade (guarantees for untied financial loans, investment guarantees, Hermes loan guarantees3) or to establish mandatory requirements for publicly owned German companies. In other words, it will still be possible to grant German businesses guarantees and loan guarantees for investments that have questionable environmental and human rights impacts. Therefore, there will be no basis for legally binding provisions for prosecuting, let alone punishing, human rights violations, curtailing of indigenous communities’ traditional usage rights, dis­­­­place­ment of settlers from areas of future resource exploitation or the general destruction of livelihoods. Developing countries rich in raw materials often use trade-policy measures, such as export tariffs or import preferences, to protect their economies, stabilize government revenues, implement an active policy of industrialization or limit negative environmental effects, depending on the politics of the day. The situation is different in China. The country controls 97 percent of global rare earth production and employs measures to regulate exports in order to exert political pressure on its trading partners. In the final analysis, China is thereby also calling the current international division of labor into question. The German federal government and the EU complain about this – often identically – as a violation of the rules of free trade and warn of adverse economic effects and job losses in Germany. In using this killer argument, they seek to end the discussion and minimize the prospects that the German population might protest. Exceptions are granted only to the poorest developing countries. Now and again, however, the EU threatens them with exclusion from the Generalized System of Preferences4 that grants them preferential access to the European market. The continuation of liberal trade policy advocated in the German and European raw materials strategies therefore systematically stands in the way of the possibility of sustainable and fair raw materials management in the interest of the populations of commodity-rich countries, and ultimately in the interest of us all. The issues of recycling, substitution and resource efficiency are granted only marginal attention in both strategies: neither our patterns of resource consumption nor the constantly growing demand for resources worldwide are called into question. On the contrary: as the German federal government considers the situation on the international commodity markets to be “very critical,” it strives to support German businesses in entering the exploration business themselves. While the strategies do mention that such projects must “also take into consideration the protection of the climate, the soil, the water, the air and biological diversity,” binding clauses protecting human rights and the environment as well as social criteria are nowhere to be found. 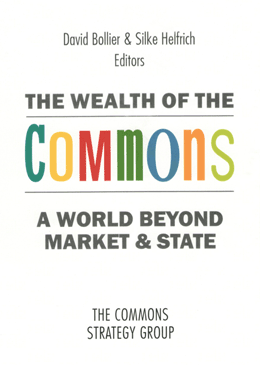 In other words, from the perspective of resource policy, the opportunities for the commons to develop are coming under pressure from various sides. For one thing, in many resource-rich developing countries, the state is taking over control of the management of local natural resources, often without taking account of the social and ecological consequences of such action. The contracts between governments and multinational corporations are overwhelmingly designed in such a way that only little money flows to government coffers and therefore, only a small amount is available for the common good. Although many developing countries succeeded in concluding significantly more advantageous contracts in recent years and are therefore in a position to sell their commodities at higher prices on the world market, this, too, guarantees neither sustainability nor social participation. The conflicts mentioned above between the community’s claims to land, soil and water on the one hand and the control, managed by nation-states, over the resources on the other, will remain in any case. The losers in these conflicts are often the local communities, as is documented impressively in the present volume. The raw materials strategies of the German federal government and the EU aim first and foremost to access those resources that others are – literally – sitting on. This sidelines the interests of the local populations. Despite their own commitments to attaining coherence in development, (foreign) trade and investment policies, these policies thwart the German federal government’s and the EU’s efforts at poverty eradication or stabilization of the climate – and options for self-determined, commons-based development paths dwindle. 1. Editors’ note: Rare Earths is an abbreviated form of the correct term rare earth metals. The rare earths include cerium, yttrium, neodymium and many others. Although they are fairly abundant in the Earth’s crust, they are dispersed widely or mixed with other metals. In other words, larger deposits are indeed rare. That is why a large part of industrial production of rare earth metals occurs by means of chemical processing during extraction of other metals present in higher concentrations – with the corresponding consequences for the environment. 2. See César Padilla’s essay on mining in South America in Part 2 and Gerhard Dilger’s essay on Belo Monte in Part 2. 3. Editors’ note: Hermes loan guarantees are state guarantees for high-risk export transactions. If the customer abroad does not pay, the German state steps in. For more than 60 years, the Euler-Hermes Kreditversicherungs-AG (a private credit insurance company) has been a leader in implementing this program, which is why the terms “Hermesdeckungen” or “Hermesbürgschaften” have become established for such guarantees. This kind of export insurance can be granted for export transactions deemed worthy of support, and at defensible economic and political risk. It is not unusual for large dams or atomic power plants to be considered eligible for assistance. Between October 2009 (after the change of government in Germany) and August 2010 alone, state guarantees for shipments to ten atomic plants in China, France, Japan, South Korea, Lithuania, Russia and Slovenia were assumed in principle, according to environmental activists. According to ixpos.de, the foreign trade portal of the German federal government, up to 135 billion euros were included in the federal budget to secure private export transactions. These guarantees result in expenditures only if the customer in question does not pay. The goal of this instrument is to secure jobs in Germany. Comparable export-credit agencies (ECAs) and instruments exist in other European countries as well. 4. Editors’ note: In its Common Commercial Policy, the EU limits and controls undesired imports from third countries by tariffs and other means. The EU grants poorer developing countries preferences and exceptions, however, in order to support their economic development. Lili Fuhr (Germany) heads the ecology and sustainable development department of the Heinrich Böll Foundation’s head office in Berlin. Her focus is on international resource and climate politics.